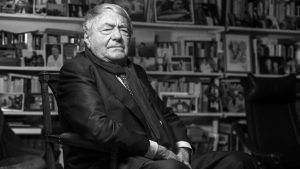 Lanzmann passed away earlier today at the age of 92 in France. Lanzmann was born in Paris, France in 1925 to Jewish immigrants from Eastern Europe. His family went into hiding during World War II. He later joined the French resistance at the young age of 17.
become one of foremost films in Holocaust remembrance since its release in 1985. Shoah, a Hebrew word, eludes easy definition. It has bedeviled translators, who have wrestled its multitudes into grim English stand-ins such as “catastrophe” or “calamity” or “annihilation.” But no single term quite manages to bear the word’s weight. Lanzmann was a man of strong convictions. He believed that Polish anti-Semitism was an “essential condition” of the genocide; indeed, the lack of anything in “Shoah” that would cast Poles in a better light led the Warsaw government to demand that the film be banned after its premiere in Paris. Holocaust survivors who had been closest to the mass murder of their people. these and other generations,” said Yad Vashem Chairman Avner Shalev. Yad Vashem, the World Holocaust Remembrance Center, was established in 1953.